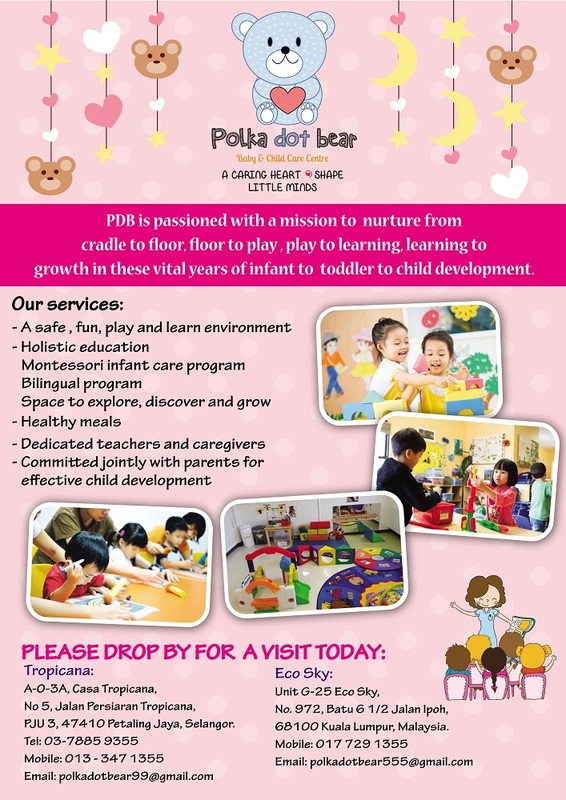 Polka Dot Bear is a child care centre that professionally delivers a caring, fun, friendly and safe environment. We cater for children mainly from ages between 2 months to 6 years old. We have conducive and well-equipped facilities. Your child can happily play and learn at his/her own pace. As parents you are your child’s most indispensable teacher. You understand the essence of the vital growing years. 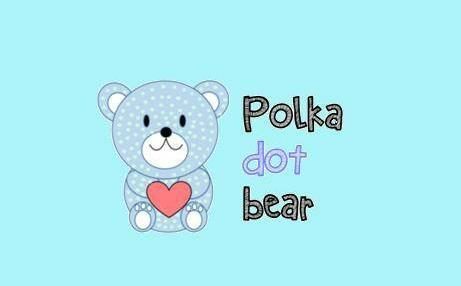 At Polka Dot Bear we provide a creative atmosphere which is both invigorating and challenging. Children thrive best through opportunities to explore, experiment and discover with hands-on experience and with proper guidance and coaxing from caring teachers. 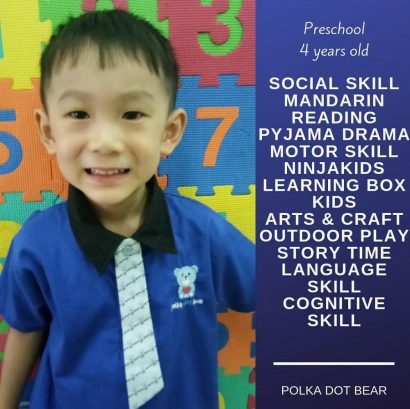 Polka Dot Bear is a small school that offers a “home-from-home” setting that is ideal and a foretaste of preschool experience for your child. It is foundational in preparation for kindergarten. 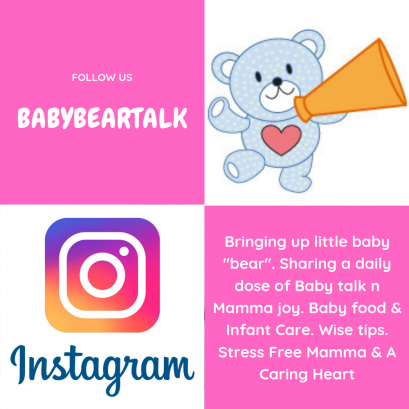 Heavy as the responsibility may be, Polka Dot Bear considers it an honor to be entrusted with the education, learning and care of your child. Building into their lives, by building character and moral values, thus giving them their future and hope. Firstly, Ashton has better command on English language, can understand more words and his vocabulary improved as well. He is better at expressing himself. He is also more independent now as he learned how to take orders and complete some tasks without any help from us. He is more creative and imaginative. He sings a lot and will create own story plot when he is playing with his toys. When my husband and I were looking for a kindergarten for our children, we wanted their first experience to be in a loving, caring and homely environment. Where they receive professional care and feel safe. 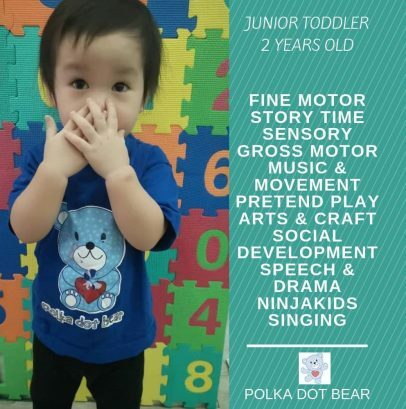 We found all these qualities at Polka Dot Bear. We knew our kids had the best teacher in the world. When we were on the holiday and they said "Mom, I miss going to school." Thanks for making our kids looking forward to getting a good education. Yan Yan has been telling us that she likes the teachers and all her friends at school. She loves the food and activities. (specially the new Pyjama Drama Session). Recently she enjoys playing at school until don't wanna go home. That, I guess is the most solid proof that she really enjoys being at school! 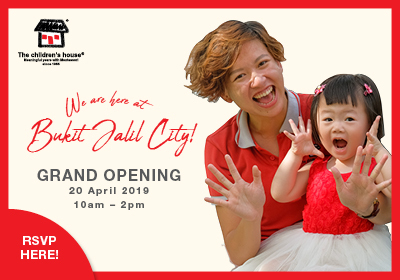 Thank you to the awesome team at Polka Dot Bear for taking care of Yan Yan and making her happy second home all these years. Jon was only 2 months old when he started nursery. It was natural that we worried about leaving him with someone else but it wasn't necessary. The nursery staffs have been supportive, trusting, competent and caring. This is particularly apparent when Jon had an accident with forehead injury. They gave necessary assistance and handled it professionally. They genuinely care about the kids that they support. They are a lovely team of people in which we could trust. A huge thank you to everyone at PDB from the bottom of our hearts. 1. Very convenient! It's just downstairs of our condo. 2. The environment is warm, nurturing and home-like which makes it easier for children to adapt to. 3. The population is just nice and its easier for teachers to focus on each child. 4. They have playtime outside the walls! I took this as one of the most important advantages as children need to play outside and get some fresh air. Children stays indoors most of their time at the school, but taking them outside for at least an hour a day made a huge different to their development. Besides, playing and getting fresh air, they are also getting natural vitamin D from the sun! 5. Some mixed-age activities that allow younger children to learn specific skill sets from children who have mastered them. 6. After school activities are fun and it encourage the children to be interactive with positive attitude. 7. PDB also encourage students to develop a keen interest towards learning independently, teaching them to be confident and enthusiastics learners. 8. PDB also offers both individual and group learning experiences and every child has a great personal portfolio on their development. 9. Teachers are very helpful and dedicated with their job. 10. Teachers are very familiar with the ability of each kid which is very important for us as parents so that we can work together for their development. 11. My daughter loves the teachers and for us, it’s the sign that she is taken care well. 12. PDB also encourages children to think creatively and to be aware of the nature and the world around us. 13. Every birthday counts! That’s why children are very excited with parties and gifts they brought home with. 14. Promotes mix-race environment which is also very crucial to children to embraces the differences between each other. 15. PDB also encourage children to be responsible by allowing them to help keeping toys and helping those who are younger than them. 16. Great job Polka Dot Bear! 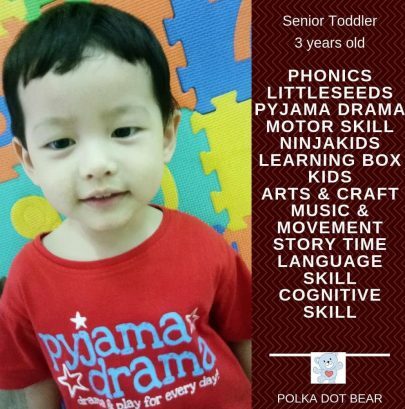 My husband and I were looking for a good playschool for our elder son who turned 2 years 4 months old in July 2017. It was an 11th-hour decision to enrol him to a playschool. 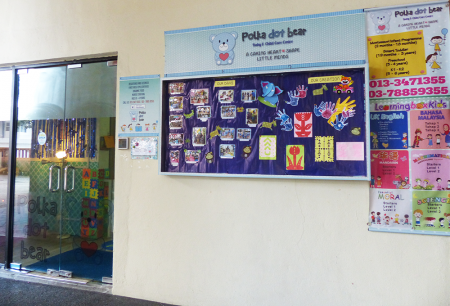 So, we started approaching many schools/centres in our neighbourhood including Polka Dot Bear (PDB) and finally we registered him at PDB under their full day program. What we like about PDB is because the number of kids in this school is not as congested as others which it has met one of our requirements in our picking list. Also, the school settings are very lovely (clean, tidy and comfortable). We are grateful that all staff are really friendly and good and they helped our son’s smooth transition with proper care and attention. 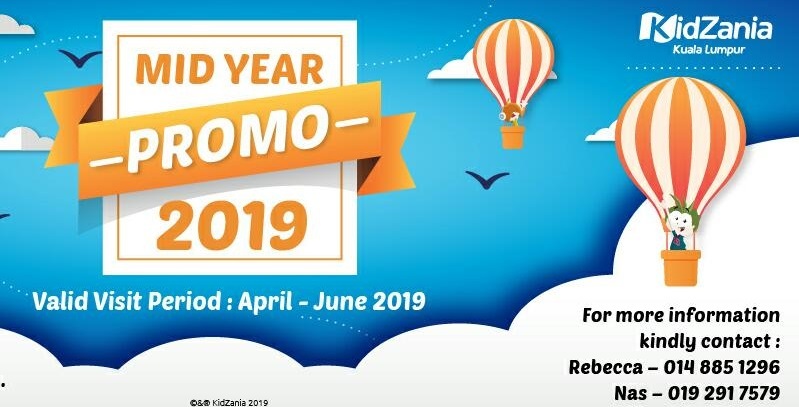 Their school programs and activities are pretty fun too and it’s definitely a great learning opportunity for our son to pick up something new and enjoyable at this age. Thankfully we found PDB, and we have no doubts to have our son continue staying with them. Do consider this school if you are looking for one for your child. 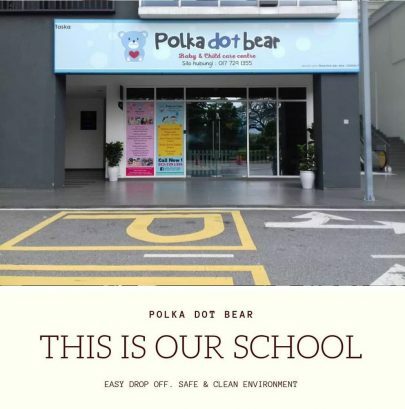 Polka​ ​Dot​ ​Bear​ ​offers​ ​a​ ​friendly​ ​and​ ​secure​ ​place​ ​for​ ​my​ ​children​ ​to​ ​mature.​ ​It​ ​is​ ​an​ ​integrated part​ ​of​ ​our​ ​community,​ ​so​ ​our​ ​whole​ ​family​ ​have​ ​made​ ​friends​ ​through​ ​the​ ​centre. It​ ​is​ ​a​ ​professionally​ ​run​ ​kindergarten,​ ​with​ ​good​ ​communication​ ​from​ ​Ms​ ​Kathy​ ​and​ ​the teachers.​ ​They​ ​regularly​ ​organise​ ​day​ ​trips,​ ​and​ ​school​ ​events,​ ​which​ ​offer​ ​a​ ​variety​ ​of experiences​ ​to​ ​excite​ ​the​ ​young​ ​minds.​ ​These​ ​events​ ​are​ ​always​ ​well-planned. My​ ​children​ ​feel​ ​comfortable​ ​going​ ​there​ ​in​ ​the​ ​mornings,​ ​and​ ​often​ ​have​ ​lots​ ​to​ ​say​ ​when​ ​they get​ ​back​ ​home,​ ​later​ ​in​ ​the​ ​day.​ ​I​ ​am​ ​happy​ ​with​ ​their​ ​learning​ ​and​ ​mental​ ​growth,​ ​guided​ ​by​ ​the teachers.